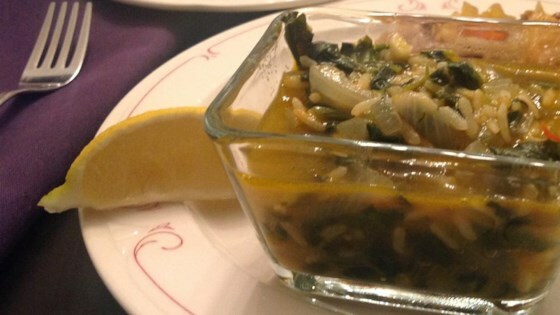 "This is a classic and tasty Greek recipe for spinach. Easy and quick to cook, and it is certain to be consumed quick too! Serve with fresh lemon juice and the famous Greek feta cheese." Pour 2 cups water into saucepan, and bring to a boil. Mix in garlic, tomato paste, bouillon cube, salt and pepper. Reduce heat, and cook at a low boil about 15 minutes, until water is reduced by half. Stir rice and remaining water into the spinach mixture. Return to boil, reduce heat , and simmer covered 20 minutes, or until rice is tender and fluffy. Watch how to make this top-rated Greek spinach pie. Very good! I used chicken stock instead of water, and chicken bouillon instead of beef. I also added 1 tsp each of oregano, thyme and basil. A real hit at my dinner party! dis were wicked man.......... but a bit bland.